In my article “Tiger Woods Reveals Secret To Success” (CLICK HERE to read), we talked about the importance of distance control. Hitting greens in regulation is one of the biggest correlates to handicap – and with 94% of amateur golfers being short of their target, this means that a lot of shots can be gained by improving our distance control. 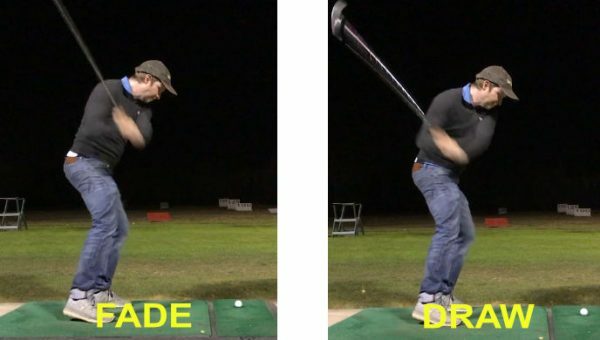 This is why my program, The Strike Plan, has been so successful in making golfers shoot lower scores. CLICK HERE to learn more about it. Striking the ball better and improving your distance control means that you will hit more greens (left) even if your side-to-side dispersion is the same. Practicing this skill at home/in your back garden in a net can be tricky. Even on the driving range, it can be difficult to gauge how far the ball went. 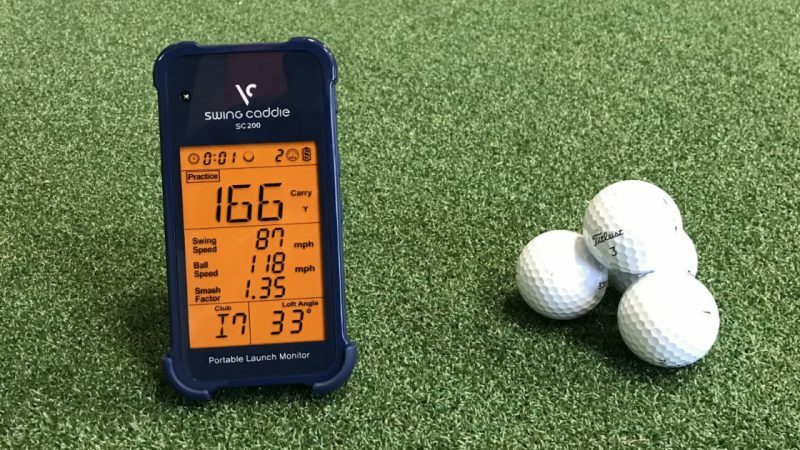 This is why almost every professional on tour now uses a launch monitor in their practice sessions to more accurately gauge how far the ball is going. At our facility, we are incredibly fortunate to be able to use high-end radar devices, such as Trackman and Flightscope (which measure how far the ball goes, as well as what the club did to the ball). But these devices cost big bucks – $15-25K. Out of the price range for most hobby golfers. However, a good friend of mine recently told me about the Swing Caddie SC200. It sells for $289 and has a 30-day money back guarantee, so I thought I would get one to test it out for myself. After setting it up (which takes a couple of seconds), I pulled out my 7 iron (which I know I hit 170-175 on a good strike). Lo and behold, this little device kept calling out very familiar numbers. 175,172, 171, 173, 170…. you get the picture. I hit one a grove thin…. 166 …. sounds about right. I absolutely flushed one …. 178 …. sounds perfect to me. I was very impressed. 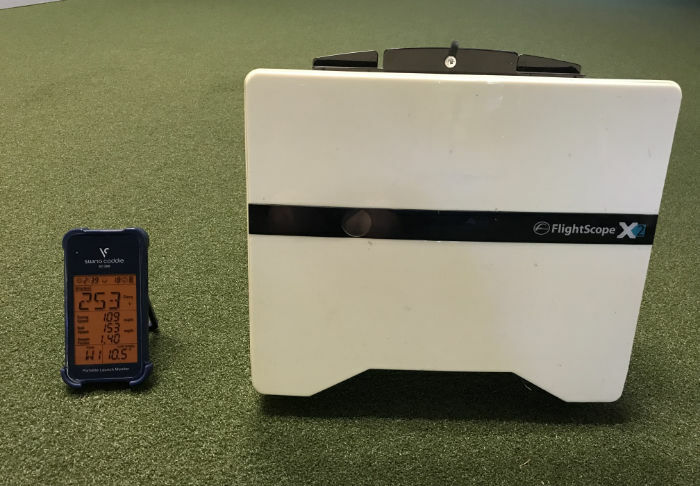 I had to test it out against Flightscope – a $15K device. Flightscope on the right, versus the Swing Caddie SC200 on the left. David Vs Goliath. I set the two devices up together and did a few shots to test. I recorded club speed, smash (speed the ball comes off in relation to the club speed), and the all-important carry distance. Below are the results for the distance. The average swing speed was just under 4mph faster with the Swing Caddie than with Flightscope, and smash factor was a bit lower (meaning ball speeds were actually very similar between devices). 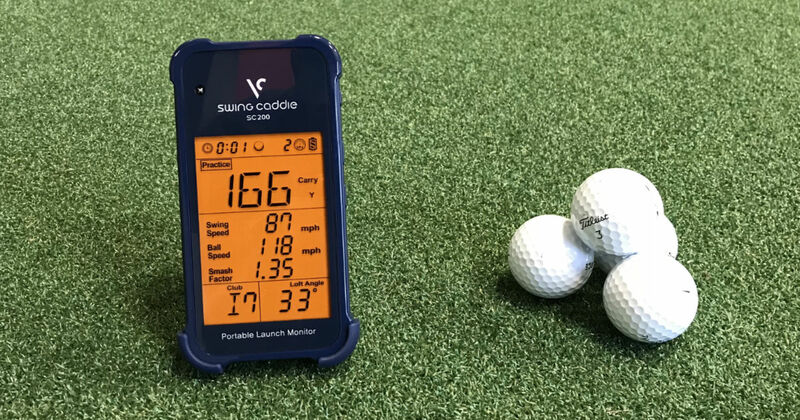 So you can see, in comparison to this $15K device, this little $290 launch monitor held up incredibly well – producing very similar numbers. 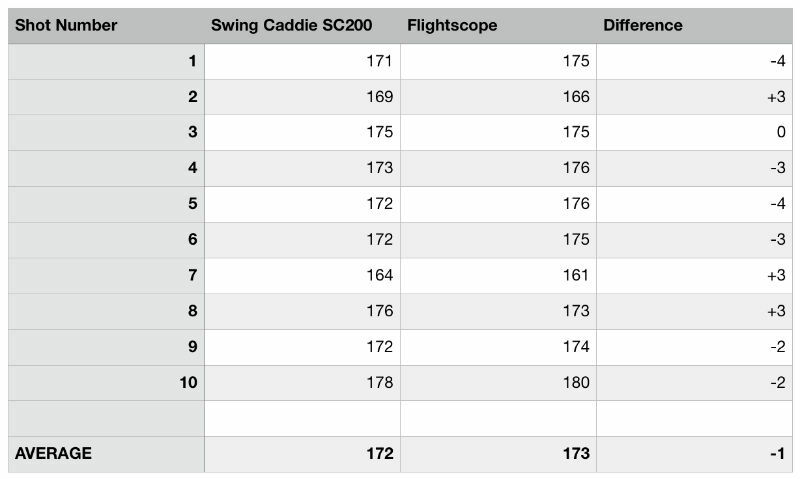 The clubhead speed did seem to be slightly over-estimated by the Swing Caddie SC200, thus the smash factor numbers were slightly lower than what Flightscope stated. However, they were consistent, and so if you are using this device to practice and see how you improve relatively, it is very accurate. I took the device indoors and tested again – same numbers. It seemed incredibly stable in the data it was spitting out. This was the biggest test for me. Driving is one of my strengths. 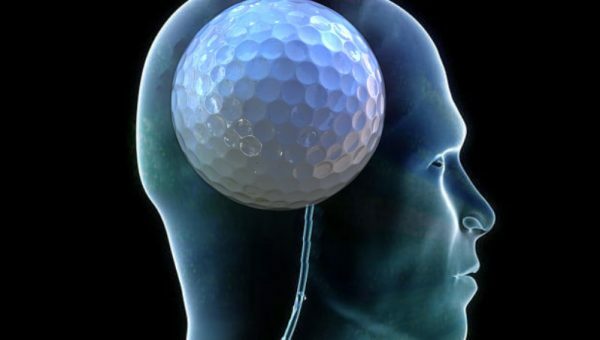 But I do something really weird – I launch the ball much higher and spin the ball much less than most golfers do. This leads to really maximising my distance for my swing speed, but I’ve noticed that radar devices (even some high-end ones) can struggle with my ball flight. Most golfers launch it at 8-10 degrees, with higher spin rates (white). My higher launch and lower spin combo produces a longer shot for a given ball speed (purple). 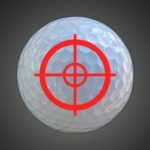 I’ve had some of the most expensive devices throw a few “bad numbers” out at me – such as saying the ball carried 180 yards as we see it visually sail over the 250 sign. Usually, this is a result of the radar device not capturing the spin rate of the ball correctly (which can be alleviated by using metallic stickers on the ball, but this isn’t really practical). How did the Swing Caddie SC200 do with my driver? The carry distances were down a little. Normally (confirmed by Flightscope), my carry distance with a driver is around 260 (totaling about 285 with roll). The Swing Caddie SC200 was giving me carry distances of 245 – so a 15 yard drop. However, the numbers were incredibly consistent. In fact, because Flightscope sometimes doubled my spin rate on certain shots (producing a bit of a wild carry distance number), I would say that the Swing Caddie threw out less “outlier” numbers. I think the SC200 reported lower carry distances because of the unusual way I launch the ball (17 degrees and usually less than 2000 rpm spin). 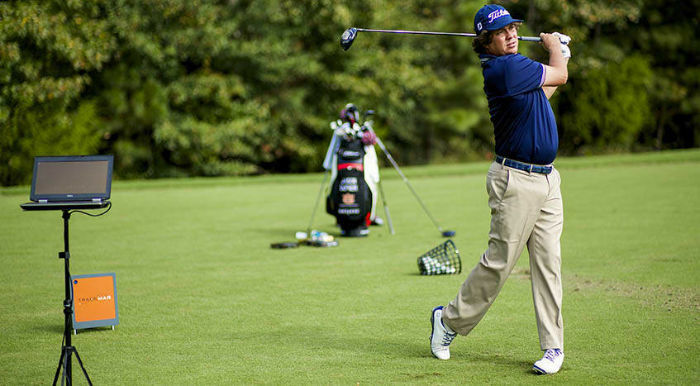 Most golfers launch closer to 10 degrees, with higher spin rates. The SC200 probably isn’t set up to handle my strange launch conditions. However, for most golfers who launch the ball in a more “normal” way, the Swing Caddie SC200 is going to produce pretty accurate carry distances. And it’s important to remember that it still did quite well, even with my strange launch. I’m a pro, and I strike the ball very consistently well. 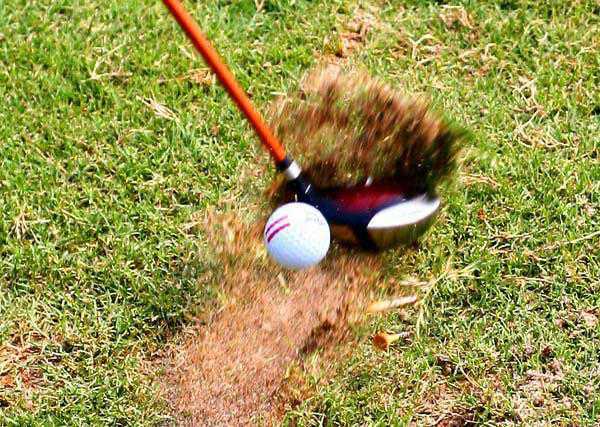 What about golfers who strike the ball worse? 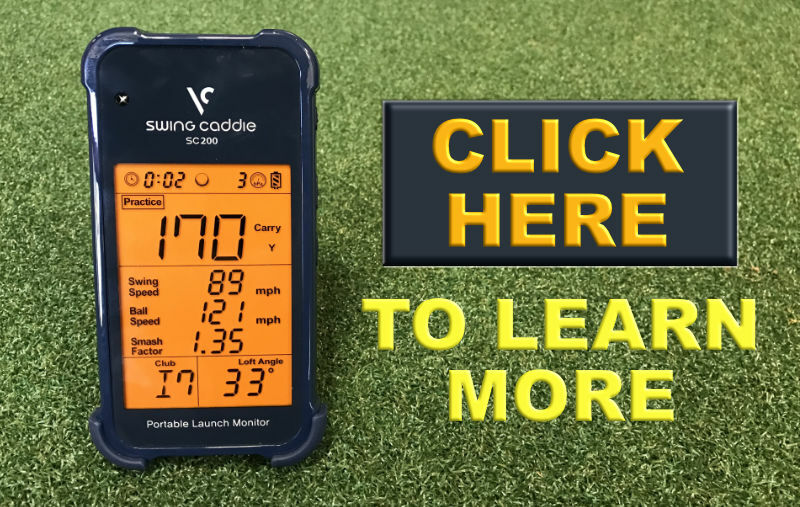 One of the beauties of the Swing Caddie SC200 is that it is so simple and quick to set up that we now use it in a lot of our group coaching classes with higher handicap golfers. It works amazingly well – it picks up almost every shot (which has always been a problem with other cheaper launch monitors), and the numbers seem to match pretty well with what we see visually (and what I would predict). You get the odd “duds” – like when someone absolutely blades the nuts off it or tops it. 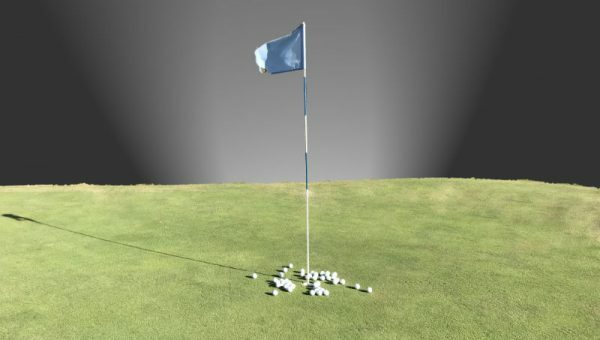 However, those types of shots are pretty easy to determine as duds, and for the practicalities of working out your distances with each club, you wouldn’t be using those in your data collection anyway. Another advantage of this device is that it sits behind the golf ball. We have used other launch monitors (which we found less reliable) which sat in shanksville – and they got beat up pretty bad. The SC200 won’t get hit at all, by club or ball. Also, because the SC200 is so small (it fits in your pocket, about the same size as the biggest Iphone) you don’t have to lug around a huge amount of equipment, and takes just a few seconds to set up and take down. It doesn’t register for really short shots – so anything under 30 yards is out (but over that distance is good). 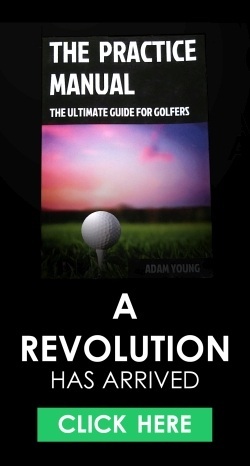 It might give higher or lower driver distances if you launch the ball unusually low or higher than the average golfer. 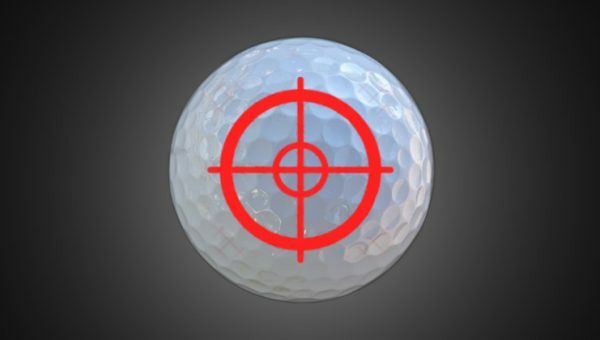 However, I found these numbers were still within around 5% of my normal distances, and were incredibly consistent – and this shouldn’t be an issue if you launch the ball normally – like most folk. You should – it makes for a much better practice session, as you are getting immediate and high-quality feedback (which has been shown to increase your rate of learning). I don’t do product recommendations in general, so why am I recommending this? Well, I think the product is great and would help a bunch of golfers – and it is a perfect companion to The Strike Plan. You can CLICK HERE, or click the image below to learn more about the device. The perfect companion to this device is my program, The Strike Plan. 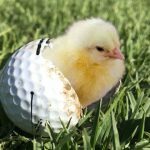 I am a beginning golfer that wants to learn his distances. After your second reccomendation of the swing caddie sc200 I decided to purchase one. My question is, do you know the difference between the swing caddie sc200 and the swing caddy 2? 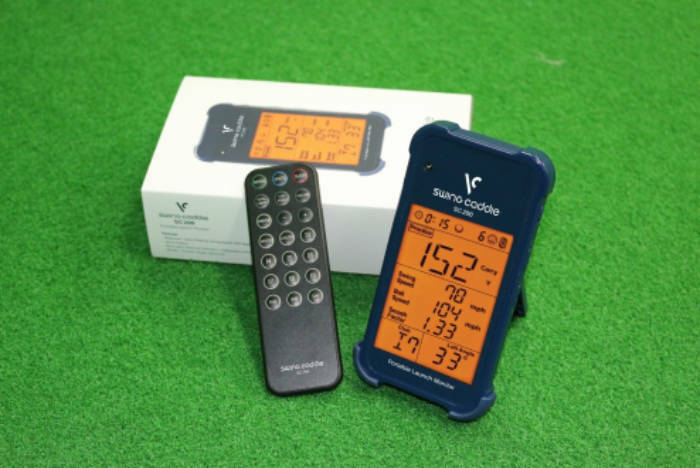 The only difference I can find on the internet is that the swing caddy 2 comes in a nicer box, includes the batteries and has a nice leather storage back with it (plus it saids ‘swing caddy 2 / voice caddy’ on the front in staid of ‘swing caddy sc200 / portable launch monitor’). The swing caddy 2 is also a little bit more expensive. Do you know if there are some important technical differences? Hey bud. I’ll be honest, I don’t know the difference between them. Does the unit indicate how far offline from the target line the ball lands? Thanks for the review. Got to practice with a Trackman the other day and as you said, I was 10-15 yards off my yardage and that is why I was consistently short to greens. This seems like a great little tool I can take and improve my practice sessions. Thanks again for the review. I purchased the swing caddy and I am happy with it. Thanks! Hey Adam, sounds like you were able to get accurate numbers indoors? 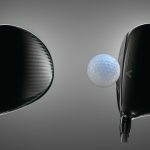 The club speed/ball speeds look accurate for me indoors, but the distances seem way off. Did you have to play with the distances between the unit and the ball and the ball to the net at all? Hi Rick. I just set it just over a yard away from the ball. It seemed pretty consistent even when the device was slightly elevated. 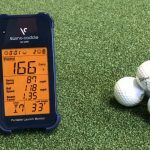 If you are getting accurate ball speed numbers, the rest should be pretty good. Can you give an example of a bal speed with a certain club and the resulting distances you were getting? I have an account with you for your wonderful products. I would like to buy 12 month subscription for Bob. Should I call you (your office)? what is the number?